If I had to choose one pudding to be my mother’s signature, it would probably be her fruit trifle. It’s her favourite to eat, and also to make, and for as long as I can remember whenever we have dinner parties, there would be a trifle waiting in the fridge. Last Sunday, we had a group of close family friends over at the house for dinner (coincidentally, one of whom happens to be my personal Martha Stewart – Aunty Rosa), and in addition to the strawberry cakes (Yes, plural!) I had baked the previous night, mum wanted me to take a shot at preparing the fruit trifle. Now, you have no idea what kind of pressure this put on me. This is her special dish! The fruit trifle is the one dessert that she loves above all else! And yet, me being me, I couldn’t leave a recipe well enough alone, and had to switch things up. So I set out to make a fruit trifle, only with completely different components. 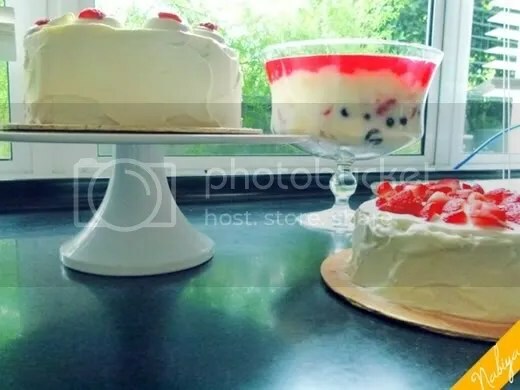 The only thing I maintained was mum’s custard recipe (which is lush), which is daunting as hell, because not only have I never built a trifle before, but it was also my first time making a custard. GARH. Contrary to the picture of our cast of characters posted above, I didn’t use all-purpose flour (it’s only there for how cute the package looks). The recipe calls for cornflour instead. Read on, my friends! So I layered finger biscuits at the bottom of my bowls (I made 2 trifles). 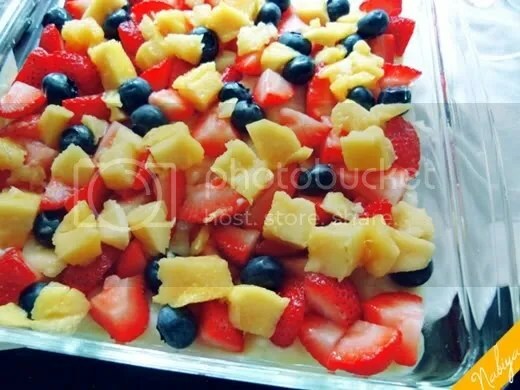 In the first bowl, I poured the custard directly over the biscuits, and in the second set I layered my sliced fruits over the biscuits and then poured the custard over. This is entirely up to you. 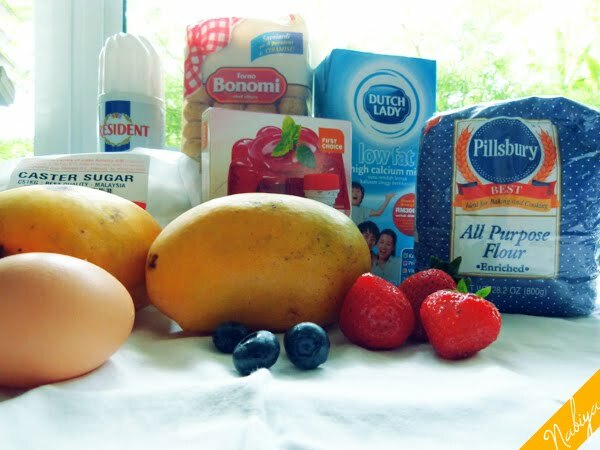 For this round, I chose to include strawberries, blueberries and mango. Mum usually prefers peaches, pineapples and mango. In addition to the fruits, biscuits and custard, I also prepared raspberry jelly. 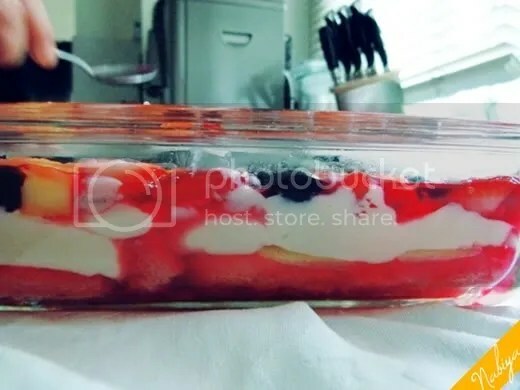 I just used some instant gelatin for this, follow the instructions on the box and then pour it at any stage of the trifle layering process. Mum prefers to use cherry flavoured jelly, but I’ve got a weakness for raspberry (not only does it taste beautiful, the colour is also so much more attractive). When you’re done with the layering, let the trifles cool to room temperate for about 10 minutes before popping them in the fridge. When it’s ready to serve, you may add a final layer of whipped cream on top if you so desire (I definitely do desire). Great pudding for hot weather, and is ridiculously easy to assemble, so this is definitely one for the fridge door.